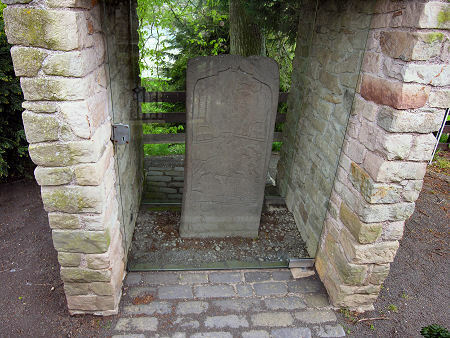 The Dunfallandy Stone is a Pictish cross slab which stands about a mile south of the centre of Pitlochry. Access is from the minor road that progresses down the west side of the valley of the River Tummel, a little south of where it passes under the A9. A Historic Environment Scotland sign points the way through a gate and up the drive past a farm, but other signs note access is pedestrian only from here, meaning you need to find somewhere beside the already very narrow road road to park. The walk from the gate to the stone is a couple of hundred yards long, past a farmstead and then up a set of steps that climb what seems to be a mound to the left of the drive. At the top of the steps you find that the Dunfallandy Stone is housed in a glass and stone construction, clearly built to protect it from the elements. 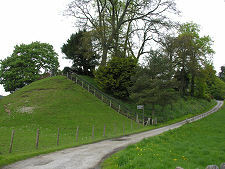 The location appears a little odd, seemingly marginalised next to the edge of the top of the mound, most of which is occupied by burial enclosures surrounded by railings. 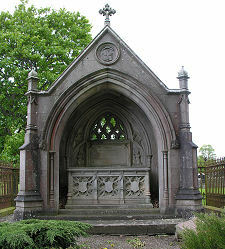 One of these is home to the magnificent tomb of Lieutenant-General Archibald Fergusson of Dunfallandy who died in 1834. This is presumably why the location was referred to in the 1860s as Mausoleum Mound. The Dunfallandy Stone stands some 1.5m high and 0.6m wide. It was probably carved some time in the 700s, and follows the pattern found on many such stones of having a highly elaborate cross carved on the front face and a fine collection of symbols and figures carved on the rear face. The spaces above and below the side arms of the cross are filled by a series of panels with carvings of animals and angels. 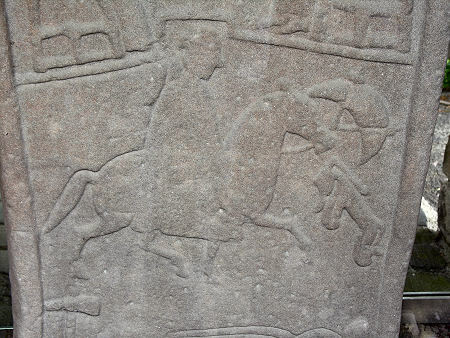 The reverse of the stone carries a number of the symbols seen on so many Pictish stones. These include fish-tailed snakes forming a frame. Most interesting, however, are the figures of three figures carved on this side of the stone. The two at the top are shown seated facing each other on ornate chairs. Between them is a cross on a table. Symbols seem to be associated with each of the figures, and it is tempting to suggest that these might mean that such symbols are, as has sometimes been speculated, indications of the identity of individuals. One interpretation of this section of the stone is that it depicts the meeting of St Paul and St Anthony, but it may equally be a scene from the life of the person the stone may have been carved to commemorate: perhaps his conversion to Christianity. Beneath the seated figures is a large carving of a horseman, again accompanied by symbols. The stone was originally known locally as Clach an t'Sagairt or "The Priest's Stone". The local minister, writing in 1845, notes that it was "long the object of much superstitious attention from the natives". 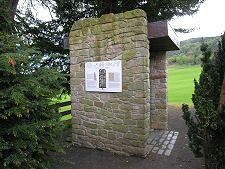 One early source referred to the stone as standing next to a chapel near the Pass of Killiecrankie, which led to speculation it had been moved to its current location at some later time. However the mound on which it stands was once home to an early chapel, and it seems likely that the Dunfallandy Stone has always stood on or close to where you see it today. The structure which surrounds it now ensures that the stone will survive to be appreciated by future generations. It also, sadly, makes the stone much more difficult to view. When we visited, reflections off the surface of the glass virtually obscured the cross face of the stone.